VERCON is a ground breaking programme from the Knowledge Management team at FAO. 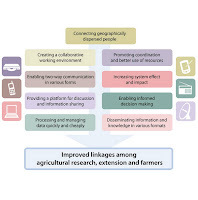 It is based on a model which aims to enhance interaction among agricultural research, extension, farmers and the other stakeholders of agriculture and rural development using Information and Communication Technologies (ICTs) and creating opportunities for collaborative work. Sophie Treinen has been managing the programme since its inception in 2000. 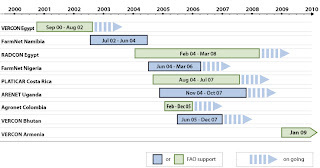 Over the past 18 months, FAO has been reviewing the work and synthesising lessons learnt. At the 2010 IAALD Congress in Montpelier, Sophie gave a well attended presentation about the programme, the underlying model and how it has progressed in that time. FAO has worked with local partners across the globe. I reviewed the programme in 2007, and it is striking to see the basic approach has been adapted in a wide range variety of locations. The FAO team are excited about the recent collaboration between the programme in Costa Rica and Bhutan, which has enabled the partners in Bhutan to learn directly from another Southern programme while the Costa Rican partners have taken back an especially good rice strain for experimentation locally. Recently, CTA has explored how mobile devices can impact agriculture (see the 2009 Mobile Observatory. VERCON has yet to successfully integrate mobiles use into any current programmes. In this interview Sophie talks about some of the plans they have for later phases.